Amazon has launched its Kindle Cloud Reader app in India. It is essentially a reading app that lets you read books in your Kindle library on a web browser offline and without the need to download or install anything. It is compatible with desktop web browsers like Chrome, Firefox, Safari and Internet Explorer (version 10 and above), as well as Safari on an Apple iPad. ING Vysya Bank has launched its ING Vysya Mobile app for Windows Phone users. The app has a unique balance meter that induces customer to keep more balance in the account and remain in the Green Zone. There is also an option to turn off this feature. The app offers features such as an option to scan and store cheque images for future reference, send SMS to beneficiary after fund transfer, locate nearest ATM or branch and more. Western Digital has launched WD TV - Personal Edition, a Wi-Fi-enabled media player which can play any media file on your USB, external drives, network storage devices or any computer on the home network. The player, which looks similar to WD TV Live, allows users to enjoy photos, video and music on their home entertainment systems by supporting many file formats, including MKV, MP4, AVI, WMV, MOV. Files can be streamed from any connected USB or external drive. It will go on sale from August. Technology firm iBall has unveiled a 3G tablet PC - Slide 3G 7803Q-900 in India. The 7.85-inch device features a quad core processor, 5MP Auto Focus rear camera and 2MP front camera for video calling and clicking "selfies". The tablet runs on the Android 4.2 Jelly Bean operating system. It has 1GB RAM and a built-in memory of 16GB (expandable up to 32 GB). It has a 4,000 mAh battery. After launching the iPhone 5c 8GB variant in a few countries, Apple Inc has now launched the device in India too. The four-inch smartphone running iOS 7 has 8GB internal storage and does not offer an expandable memory card slot. The handset is priced at Rs. 37,500 and under special offers is available for Rs. 29,500 for a limited period. 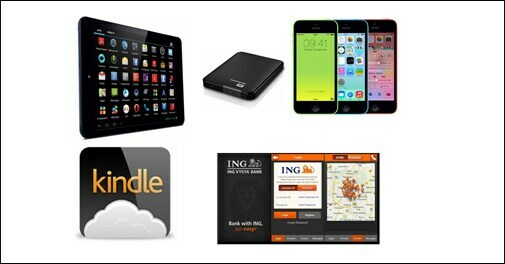 These offers include cash discount, buyback and a free case/dock worth Rs 2,300.